Bruce McCurdy: Edmonton Oilers Bob Nicholson on pending free agent Tobias Rieder during a season ticket holder event. “Toby Rieder will not be signed by the Edmonton Oilers at the end of the year. Toby Rieder was a player that other teams wanted. He came here for one year because he wanted to play with Leon Draisaitl who he plays with on the German national team. He thought if he wasn’t playing with Leon he’d be playing with Connor, he’d score 15-16 goals, and instead of making two million he’d sign a four-year deal at three and a half million. Toby Rieder has missed so man7 breakaways. TSN: Darren Dreger on Nicholson’s comments. Yeah, no question about that. Bob Nicholson would admit that he’d made a mistake. He told Toby Rieder a short while ago in a conversation he had with his forward, that he stepped out of bounds. According to Nicholson, they laughed about it. 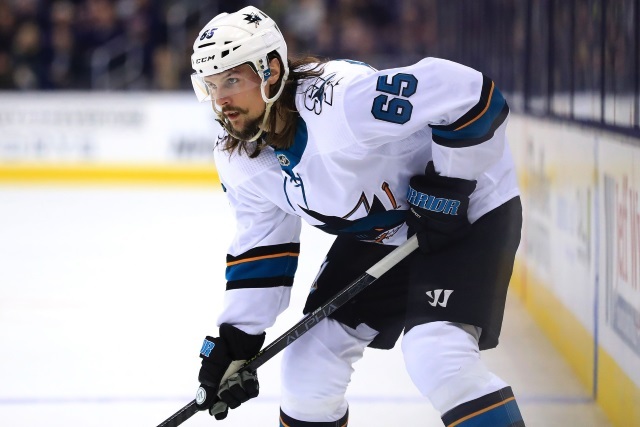 Will the Rangers target Karlsson? Chris Nichols of Nichols on Hockey: Elliotte Friedman and Jeff Marek were talking about what the New York Rangers could be thinking for this offseason on their 31 Thoughts podcast. “One of the more interesting stories now is going to be Erik Karlsson,” continued Friedman. “And we’ll see where he is health-wise when he comes back. Doesn’t sound like he’s going to be back much before the playoffs, if then.